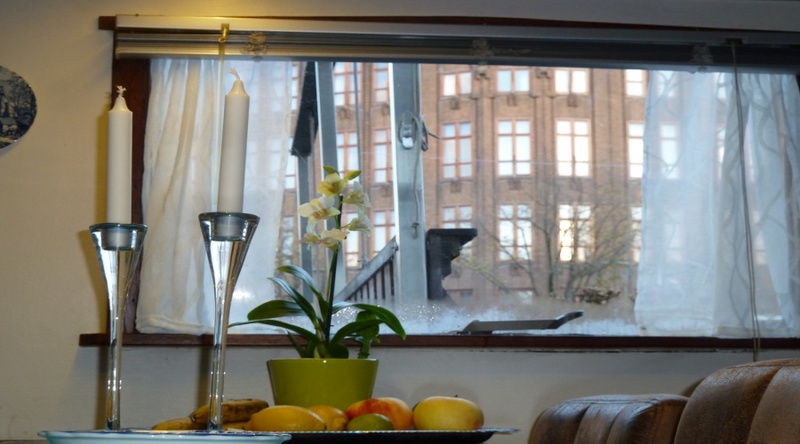 You could be living on one of the most wonderful canals of Amsterdam! If you live here, you will be sure to have a great story to tell. Not only because of the original design. The location on one of the most charming canals of Amsterdam is simply superb, and the waterfront terrace is truly one-of-a-kind. 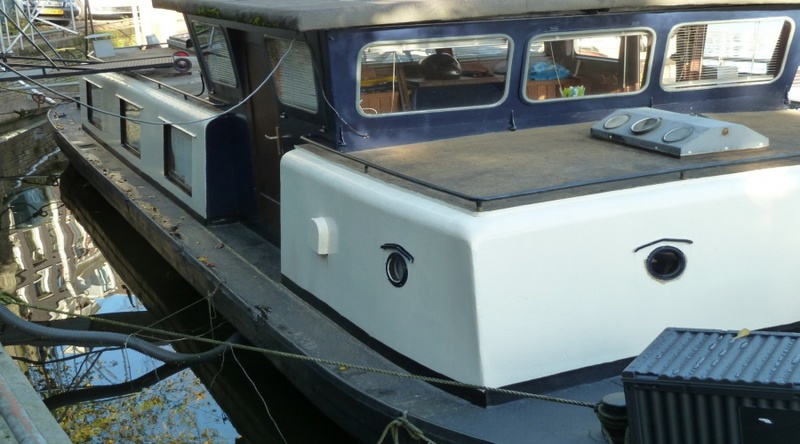 Plus: you will have a charming dinghy with outboard engine so you can be the captain of your own city cruise! After just a seven minute walk from Central Station you will reach our canal, one of the oldest and most charming in Amsterdam. You will notice that it is remarkable quiet, no tourist masses here. 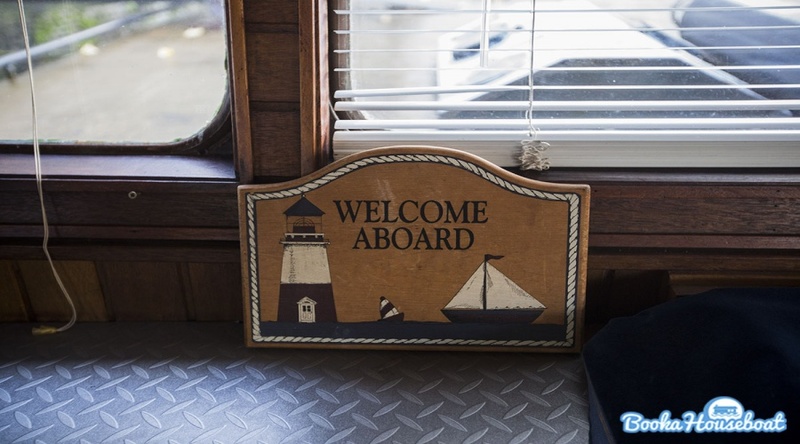 Enter the gate and step onto the boat, into a world that is unlike any other place you have ever stayed before! 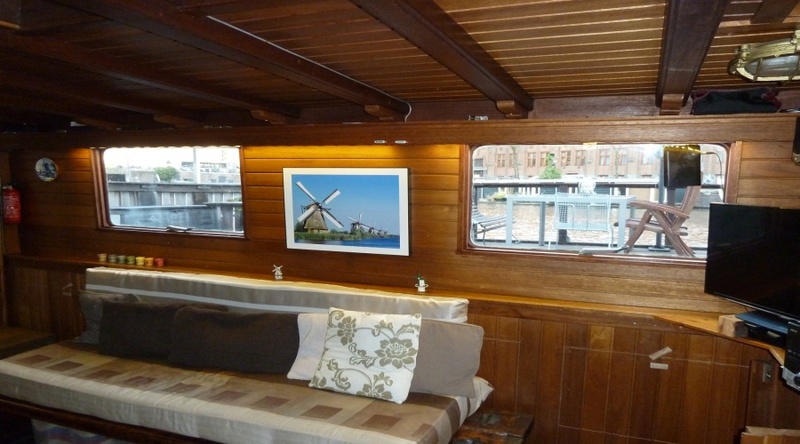 Before you get into the boat, we recommend to take a look over the water and enjoy the view over the canal. The amazing neo-gothic Amrath hotel on the other side, the world famous warehouses along the water and the great terrace that you will enjoy so much. 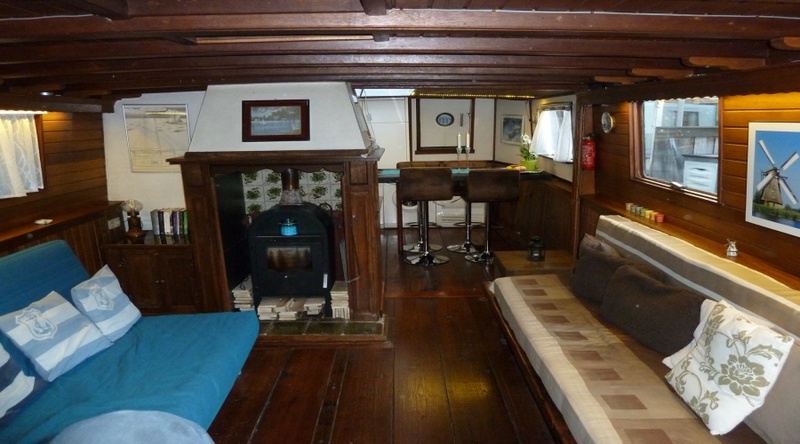 And now it is time to step aboard of this floating house. 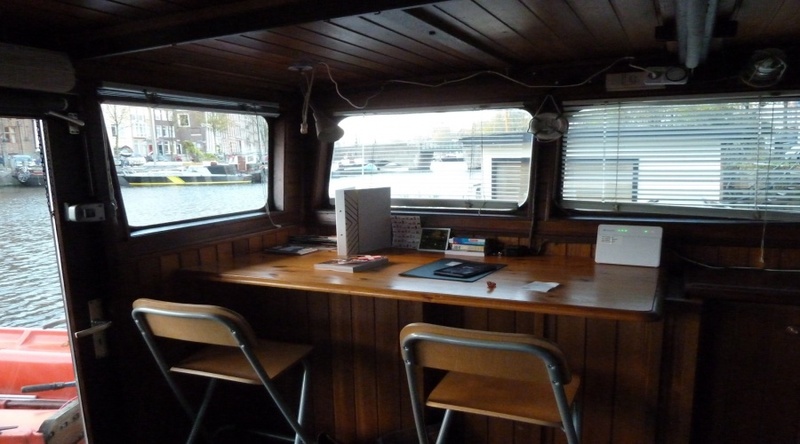 You will enter the boat via the wheelhouse (yes, this boat was originally meant to use as an actual driving ship, but plans change along the way) with nice panoramic views over the water and street. 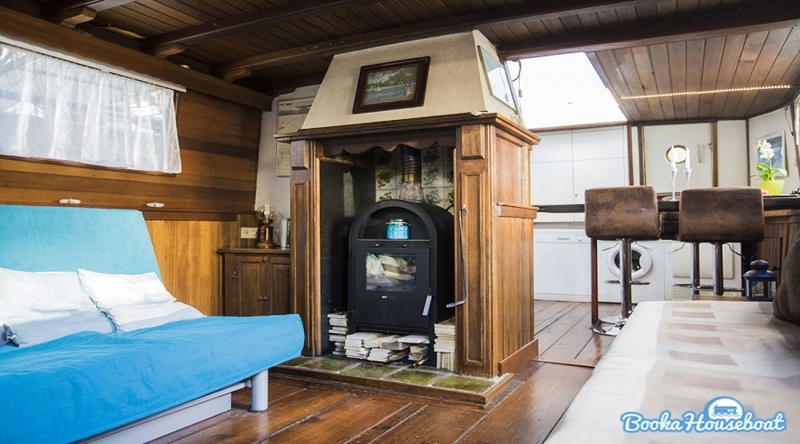 This wheel-less wheelhouse gives way to both the bedroom and living room. On the right hand side is the entrance to the living room. 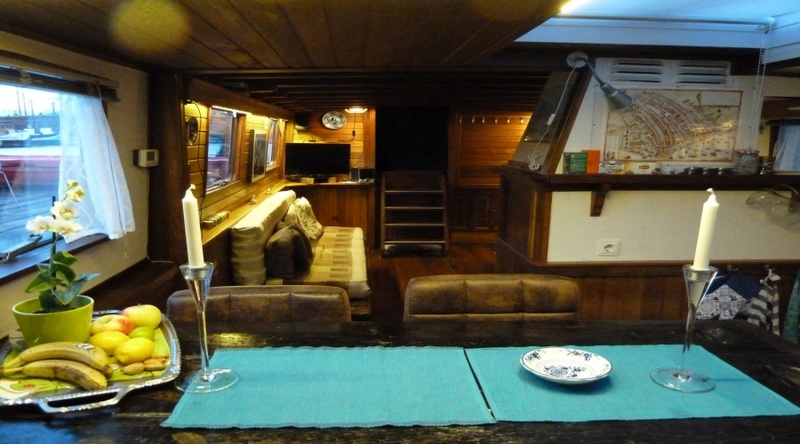 The wooden interior, the wood stove and many nautical details create a unique, warm and cosy atmosphere. The couch can be transformed into a comfortable double bed. 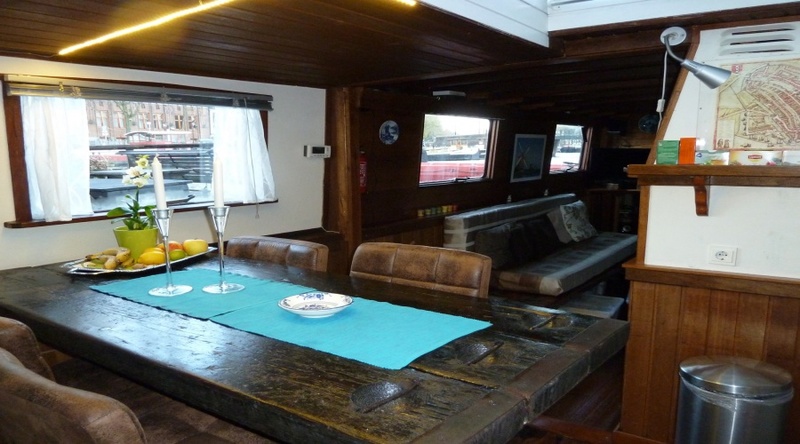 Next to the living room is the open kitchen with a high table made of traditional ceiling parts of an ancient freight ship. A great place to enjoy breakfast or diner, or just a cup of coffee while making plans for the day. 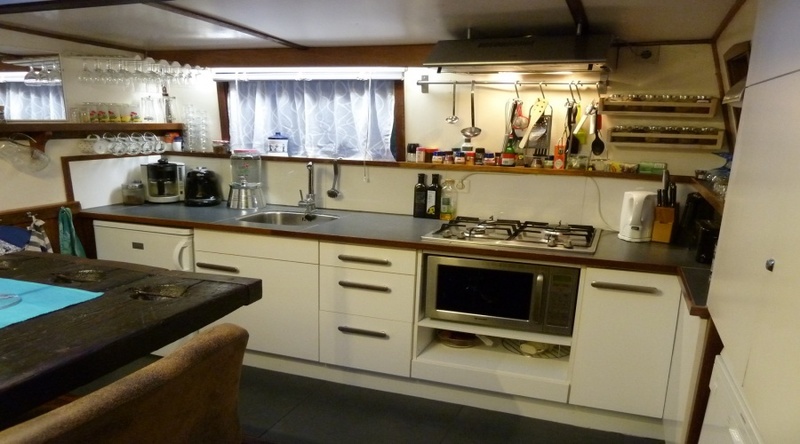 In the fully equipped kitchen you will find everything you need for a comfortable stay. Apart from the regular utensils, we also offer a dishwasher, washing machine and dryer for your convenience. 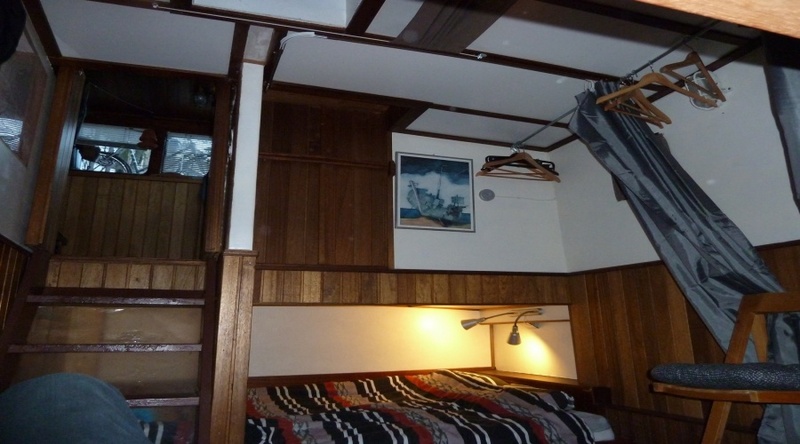 On the left side of the wheelhouse you will find the bedroom and bathroom. 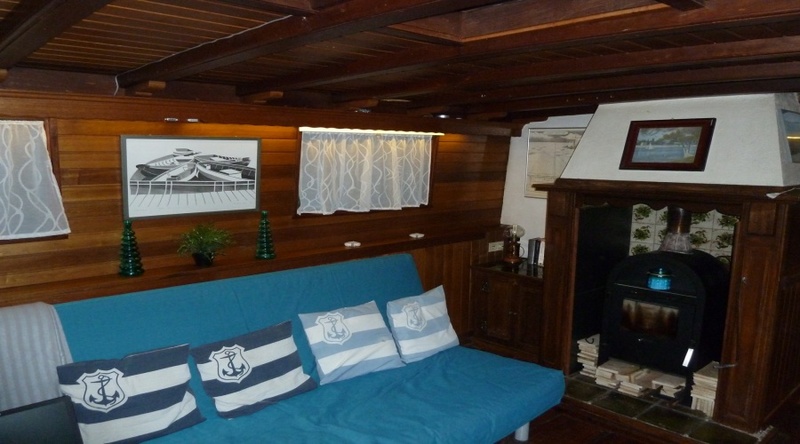 Since it is a house that is built on a barge, we have to be creative when it comes to space. 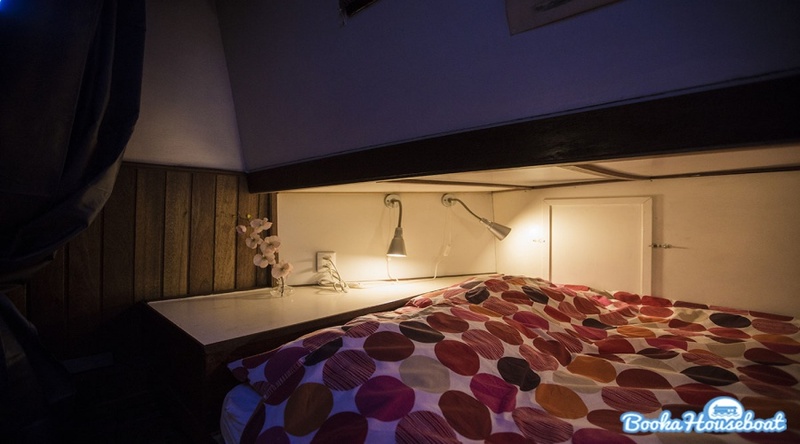 This results in a quite unusual, but without a doubt cozy place of the two double beds. 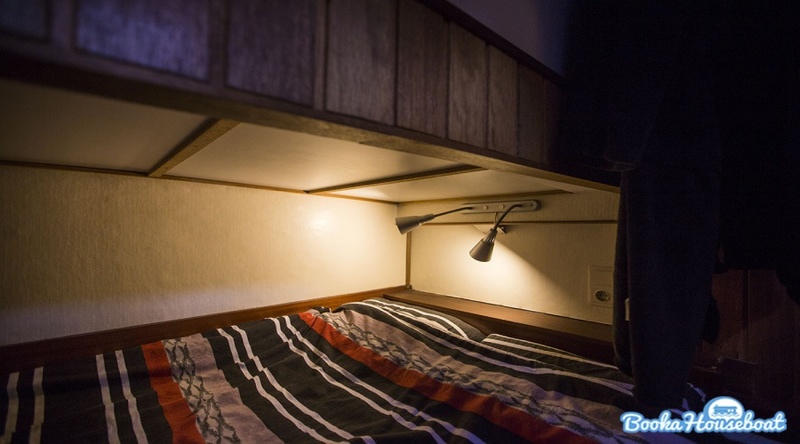 The beds are located in the hull of the barge, and the space above the bed is quite limited. However, the size is quite large (200 x 160 cm) and the atmosphere really cosy. 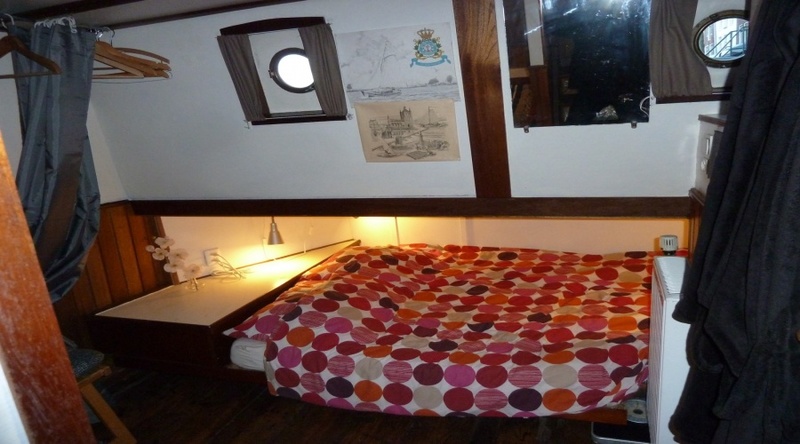 There are two double beds here, and both can be made private using the curtains next to the beds. For more privacy, you can use the living room as second bedroom if you have guests over. 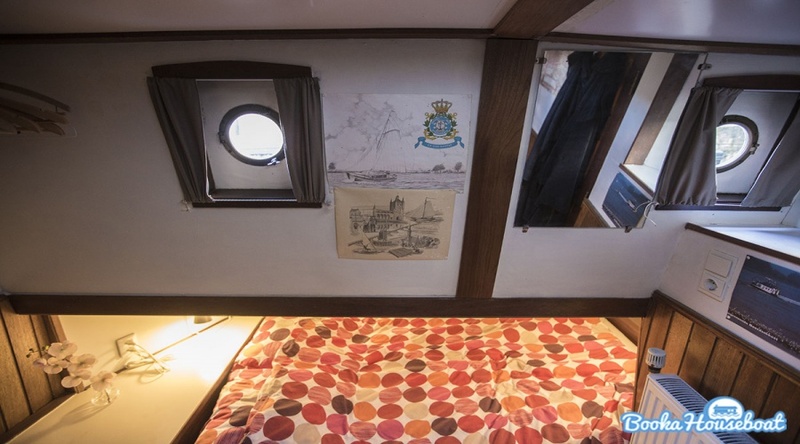 The en suite bathroom is small but convenient and offers a toilet, sink and shower. 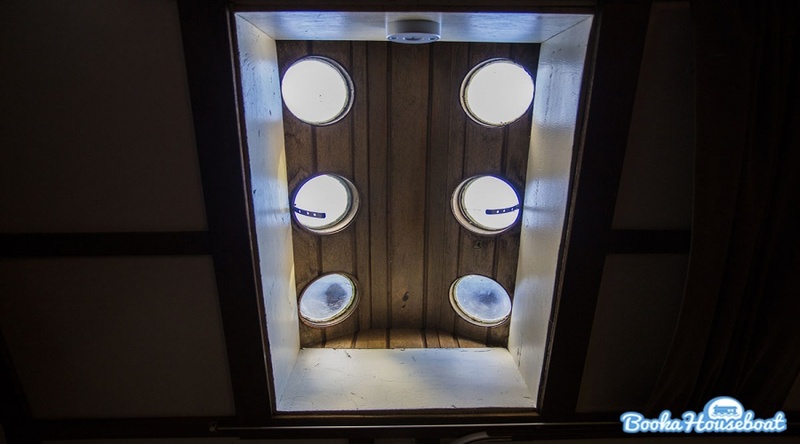 All through the boat you will find original nautical details, such as charming portholes and wooden elements from other ships. 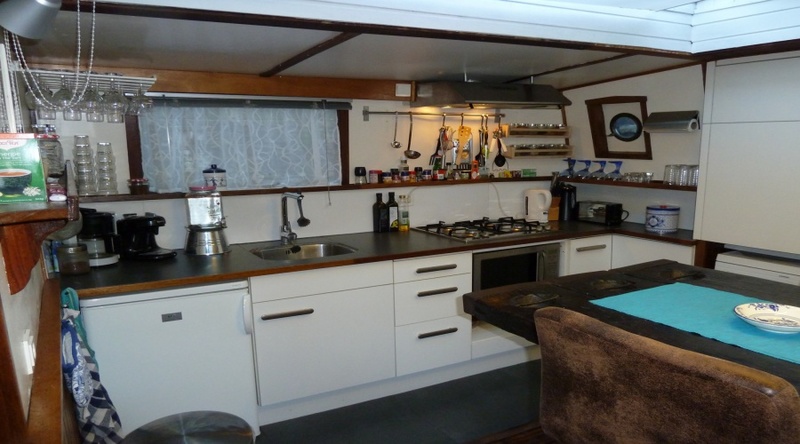 The whole boat has convenient central heating, making it a comfortable place to stay all year round – even on the coldest winter nights.